Daybreak, Thanksgiving morning 2012 . . . 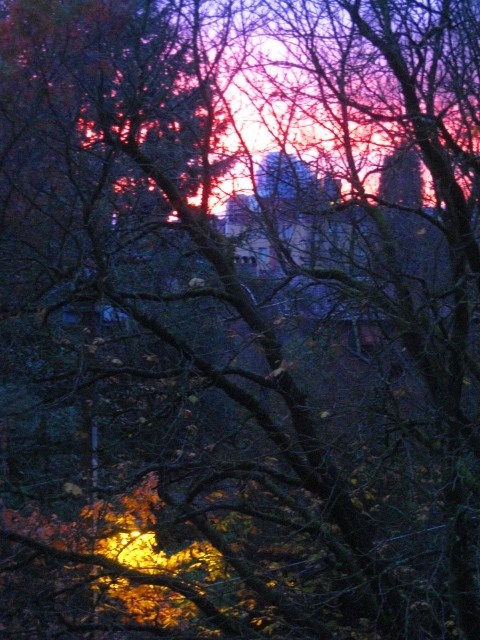 I stand for a moment at my window taking in dawn’s red sky, the streetlamp still glowing below. I can’t remember if this is a delight or a warning? And then it comes to me . . . ah oh . . . it’s a warning. I refused to accept it. I had planned a nice meaningful Thanksgiving of solitude – candles, mindfulness and gratitude. If ever I was to take a spiritual by-pass from the real world – this was it! The night before, however, I had been haunted by dreams of Thanksgivings past. As I took in the sunrise warning, I knew that my internal alarm clock — now chiming Thanksgiving o’clock — wasn’t going to let me sleep through family drama quite so easily. My dreams weren’t even about my close family. I dreamed of my former in-law family – a group of people I was well and truly done with – or so I thought. It still bothered me that I was never accepted or valued by my ex-husband’s family. My ex and I were a case of “opposites attract”. He was an outgoing extrovert from a large, Midwestern, Irish-Catholic family — and a frat boy to boot. I was a quiet introvert from the West-coast and my family had mostly disintegrated. I was bookish, intellectual, and had a small circle of close friends– and to boot also, I worked for Planned Parenthood. Partying, beer and football figured large in my ex’s life. For me it was social causes, soulful conversation and reading. My ex was drawn to my intelligence and depth. I was impressed with his confidence and ease with people. Holiday visits with his family were rough. I worked hard to ingratiate myself, but I just couldn’t gain a foothold. His family wasn’t unkind, but they kept their distance. Gatherings took place in the small familial home, which would become crammed with the six grown children, their spouses and kids, cigarette smoke, alcohol, and noise. I would escape to bed early. They didn’t understand. I began to suspect that something was wrong with me, and my ex was more than happy to believe that also. Now 10 years post divorce these people, who had been in my life for over 20 years, no longer talk to me. So they come to me in my dreams. A friend suggested I imagine the difficult people in my life surrounded by angels and held safely and lovingly high up in the sky — well away from me. So this Thanksgiving, instead of putting my in-law family in an imaginary hand-basket to hell — I gave the angel version a shot. This healing must have been ripe for the picking, because I started to feel myself emerge a bit from the foggy, pain filled maze I had wandered for so long. My perception moved from dream state to 3D. Both my internal and external vision became sharper and clearer. My surroundings and and body sense solidified. Even colors were brighter and more saturated. Everything seemed simpler and made sense. No one was to blame, including myself, and I felt compassion for the orphan I was — for my hopeless quest to complete myself with an extrovert and a family who could not live up to my idealized wishes. That day I began to separate myself out from an enmeshment with these people who I saw now as ordinary people — maybe not “my people” — but people who I had made placeholders for my pain. Damning them would damn me. Putting the demonized version of them in the care of angels also held my demonized parts safe, and I was better able to find may way out of the fog and confusion. I saw also that this was self-compassion. So this holiday season I give thanks for red skies, for parts ready to die and be reborn, and for that blessed confusing bridge and its crossing. I also celebrate my increasing ability to live in my own skin, angels holding the space for my pain, the fog’s lifting, and my own two feet — now planted firmly on the planet earth.